You can park in Sainsbury's FREE for up to 3 hours. Sainsbury's is on Green Lanes near Winchmore Hill Broadway and is approximately a 3 min walk from the salon. 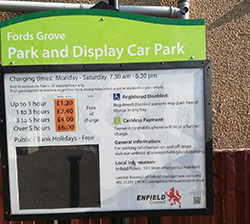 Fords Grove car park can be accessed by turning right from Green Lanes at the traffic Lights at Station Road and then entering via the farm road entrance. You can also access this parking by turning down Queens Avenue which is one way and then accessing Farm Road. Parking is FREE for 45 mins but you must still display a parking ticket. You can also pay and display for parking of 1 hour or more. This car park is approximately a 3 minute walk from the salon. There are some parking bays at the entrance to Queens Avenue located opposite the Broadway. There are residents only parking bays which are restricted between 10-30-1130. Parking is FREE at any other time outside of the restrictions. Compton Road and Station Road are located at the ends of the parade where Chi is located. There are pay and display bays opposite the salon on Green Lanes and also at the top of Compton Road. Cost is £1.50 for 1 hour or £3 for 2 hours. The 329 bus route stops outside and opposite. The 125 bus from Southgate stops at Capitol House which is located across the road from our parade. Winchmore Hill overground train is the nearest train station to us. Turn left out of the station and walk down the hill. Turn right at the main road and we are on the right hand side (approximately 5 mins walk). This entry was posted in parking and tagged parking, Parking at Chi. Bookmark the permalink.